Today advertising is the best way to promote your Small Business, Product, Website or Blog and any other thing online. 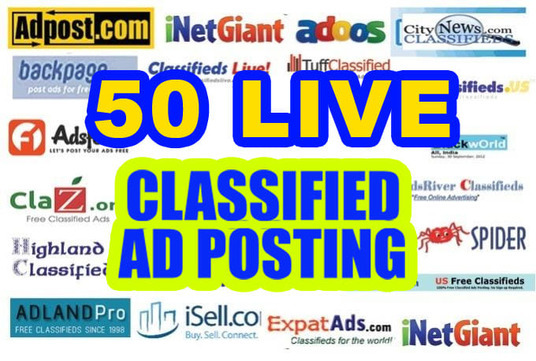 I will post your ads on different high PR Classified Websites (USA, UK, CANADA). And demand on customer side. You can send your ad with Text . All ads will be expected and given to you with full excel report. 1. i will do 50 live clickable ads postng. 2. submit your ads with images and full contact details. 3. after posting get quality backlinks and leads. 4. Ads on USA/UK/CA/AU Any countries and your described locations. 5. Ads links and ads details will be provided in excel sheet as a proof. I well post 50 clickable classifieds advertising demand on Client zone like USA, UK, CANADA is ranked 5 out of 5. Based on 13 user reviews.